1. We are primarily an evangelistic movement called to “help fulfill the Great Commission in this generation.” When we stop doing evangelism, we cease to fulfill the purpose for which God raised us up. 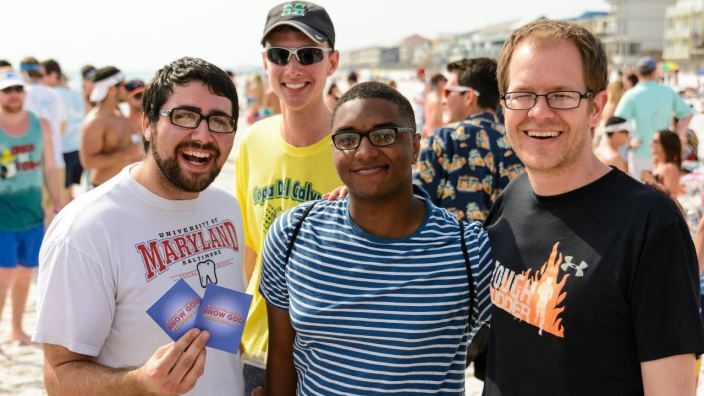 Effective evangelism flows from a desire to reach the campus. If our goal is to reach the campus then we will search out and trust God for strategies that help us to reach that goal. Unless this is our goal we will never recognize the need for effective strategies. 2. There is a correlation between sharing the gospel and people coming to Christ. Doing evangelism is always preferable to not doing it. 3. There are real barriers to productive and fruitful evangelism. Lack of biblical motivation, lack of faith, low skill level, irrelevant materials, poor social skills and ineffective strategies can all serve as barriers to effective evangelism. However, we want to make sure that we are applying the right solution to the right barrier. No new strategy or new materials will compensate for lack of heart or inactivity. No new net ever made a fisherman out of a non-fisherman. 4. Ministry leaders are looking for ideas that give the greatest return (i.e. “hot” contacts, increased fruitfulness, good training opportunities and assimilation into the movement) for their time, effort, and dollars expended. 5. Evangelism is 90% God and 10% us. God desires that people know him more than we do. We can use bold, creative strategies because God has been at work and will continue to work through us. Often times we make evangelism too man-centered...too dependent on us. Remember, “the gospel is the power of God for salvation” (Romans 1:16) not us (1 Corinthians 2:1-5). Each person’s testimony is a record of what God was doing to prepare them to receive Christ. God himself draws, convicts and regenerates. 6. There are hundreds of students on each campus who are ready right now to receive Christ if given the opportunity. There are several times during a college career when a student is receptive to spiritual input. We need strategies that throw out the net frequently enough and broad enough to reach those students. As we sow abundantly we will reap abundantly. Our distinctives include the principle of “sowing broadly” and throwing out the net frequently to see who is ready to respond today. Our main job in evangelism is to reap from those who are open, as opposed to convincing the closed (proclamation versus persuasion). Is it biblically sound and a reflection of our mission statement of helping to fulfill the Great Commission? Is it time, effort and cost effective per exposure, contact and/or convert? Is this more effective than simply doing 1-1 evangelism in a dorm? Does the effort to promote the event outweigh the results? Are those making decisions for Christ growing and getting involved in the ministry? Is it consistent with your “image” on campus? Does it exhibit integrity? Do you want your name attached to this strategy or event? We measure effectiveness primarily by what happens in the lives of our audience, not by what happens in our lives as a result. In any evangelistic strategy that we employ, we are in the process of doing one of two things. Both are necessary. We are either harvesting people whom God has already prepared through their spiritual heritage, friendship with a Christian, personal reading, thought process, working of the Holy Spirit, etc. (John 4:35-38), or we are helping to move the unprepared towards belief by giving him or her information to digest, models to observe, and facts to consider and respond to (planting and watering). The first group, in may cases, simply needs to know how they can receive Christ. The second group needs to know who Christ is and why they should receive Christ. This follows the biblical paradigms of the book of Acts. The two evangelistic models we see in the book of Acts are Peter’s proclamation message to “God-fearing Jews” (Acts 2:5) and Paul’s persuasion message to the “men of Athens” (Acts 17:22). The response to Peter’s message was the 3,000 who believed. The response to Paul’s dialogue was mixed -- “some sneered,... others said, ‘We want to hear you again...(and) a few believed” (Acts 17:32-34). We are experts in harvesting the prepared but we also need to be aware that, if this is a shrinking segment of the student population, then part of our strategy in evangelism is to bring an increasing number of students into that first group by educating and motivating students to receive Christ. In reaching the campus then, we use a two-fold approach. Surveys are the most frequently mentioned strategy for getting face to face with a non-believer. They can be used to precede team meeting talks, give you more information about the values and interests of your audience and obviously provide a natural opportunity to transition into the gospel. We can also control the flow of our contacts. As we need more contacts we take more surveys. Some surveys build the Four Laws right into them. Surveys are most effectively used by individuals who see them as a way to build meaningful rapport, have an intelligent conversation with a stranger, and an opportunity to effectively communicate their faith. We have missed the boat when we regress to being merely survey takers. There is no need to stick with the same survey week after week. It is very possible to design your survey to help you obtain information you want regarding your target audience. Each month of the year you could focus on a different survey topic (home life, aspirations, dating, stress, etc.) and have an evangelistic talk at the end of the month related to that topic. Investigative strategies are designed to educate and evangelize the unbeliever in a non-threatening environment of inquiry and interaction. Investigative Bible studies, Focus Groups, Investigative Study Breaks, Q & A times, etc. are all ways to educate and interact with students. In the US, the average person has heard the gospel seven times before receiving Christ. An outstanding way to educate the unprepared. Holidays are excellent opportunities to saturate the campus with articles relevant to the season-- resurrection, relationships, etc. Relevant topical articles that address real issues can be written and prodigally given away. They provide information to digest and respond to. Some examples include "Managing Stress and Pressure in School,” “Relationships,” “Resolving Conflict,” “Better Grades,” etc. We can use these articles in conjunction with various surveys. As we do evangelism, we always have something to leave behind that is interesting and relevant. We sow as we go. Leaving pieces educate without confronting. DVD’s or short books can also be used with equal effectiveness. Some campuses send the book Blue Like Jazz or Jesus Without Religion to every Freshman. Others make the JESUS video available to every Freshman. Weekly or quarterly newspaper spots buttress the credibility of the gospel. What would it be like for the student populace to read student and faculty testimonies from those on your campus? You could also feature excerpts from the writings of prominent spokesmen like Christian athletes, professors, business leaders, or politicians. Articles like these would not only educate the non-Christian but also strengthen the faith and boldness of the Christian. Each article could potentially be a springboard to evangelism that week on campus. Newspaper ads, such as those of Every Student's Choice (to view, go to the ESC website) give students thought-provoking questions and issues to consider. These are not designed as evangelistic tools but educational tools. Don’t try to apply the effectiveness criteria of evangelistic strategies to exposure strategies. We don’t consciously group people into those we evangelize and those we educate. We initiate with everyone but assume that those who presently do not respond need more information. Remember this: Presenting the gospel in and of itself is educational. "Strategy is the means agreed on to reach a certain goal. I contend that some strategies are demonstrably superior to others, and that we do poorly if we do not examine them all and choose the best. The best strategy is, first of all, biblical because God’s work must be done God’s way. Secondly, it is efficient . Third, strategy must be relevant. A strategy that was useful five years ago might well be obsolete today. It needs constant updating." 1. The Right Goal. Fulfillment of the Great Commission. 2. The Right Place at the Right Time. Some peoples of the world are receptive to the gospel while others are resistant. The world’s soils must be tested. Concentrating—come what may—on rocky soil, whether anyone is coming to Christ, is a foolish strategy. When the “laborers are few,” the farmer runs the risk of losing some of the harvest. Laborers are not needed when the harvest is still green, nor are they needed when the harvest has passed. Timing is of utmost importance in any harvest. Some people are ready to be harvested today, some are not yet ready. These “unresponsive peoples” should not be neglected-- someone should be there who is expert enough to tell when they are becoming ripe for the gospel. But no one who takes strategy seriously would advocate a massive labor force in green fields or to fallow fields. The laborers are needed for the ripe harvest fields. Right after Jesus says that in Matthew 9, He sends His own harvesters out in Matthew 10. 3. The Right Methods. When there is much work and little or no fruit, something is wrong. Careful analysis will usually pinpoint the trouble as either working in unripe fields or working in a ripe field but using wrong methods. You can go into a perfectly ripe field of wheat and work your head off, but if you are using a cornpicker, you will get nothing. Potato diggers are useless in apple orchards. Whenever a method is successful, the temptation arises to think it will work any where at any time. However, every new situation requires a new evaluation and often new, tailor-made methods. Therefore it is good strategy not only to set measurable goals, but also to build in from the start of the effort instruments for measuring its success or failure. 4. The Right People. God brings the harvest to ripeness, but He does not harvest it. He uses Christian people to accomplish that task, and He is glorified when His people “bear much fruit” (John 15:8). The right person is the person entirely filled with the Holy Spirit. He abides in Jesus. He is fully committed. He takes up his cross daily and follows his Master.